This weekend brought some lucky finds on Craigslist as well as my local antique store, and I also happened to turn another year older. Perhaps the purchases were a way to offset the agony of getting older? I dunno. I’ve been on the hunt for a vintage radio lately, preferably one that had a record player built in. Yesterday I was at the local antique store when I ran across this beauty. Usually when I see old wooden radios, the wood has taken some serious beating: it’s scratched, worn, cracked, or there is water damage somewhere on it. The wood on this one was absolutely flawless, and once I gave it a quick cleaning, it gleamed like it was new. The cord has been cut in the back, but I knew that could be fixed. The price was low enough to make me plunk down the money for it. 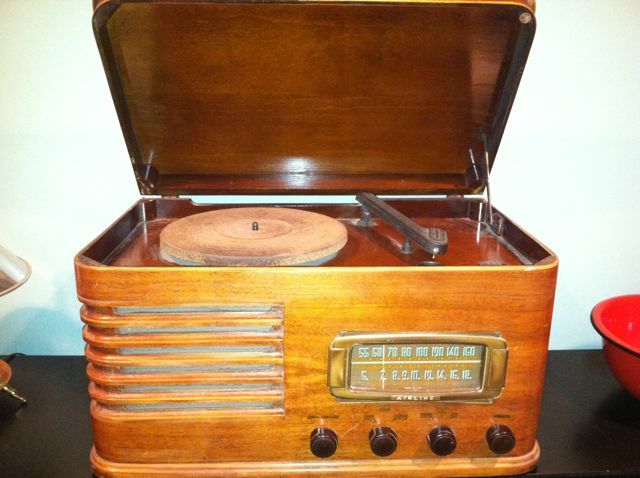 After some quick reading, I’ve found out that this is a Montgomery Ward Airline radio and phonograph circa 1941. There were many, many versions of Airline radios, and an internet search didn’t land any exact matches for pictures or resources for this particular model, but I loved the fact that the wood was in such good condition, the original knobs were still on it, and there was a phonograph on top of all of it. There’s even a little depression next to the phonograph that has a bunch of spare needles in it. Score! I will admit: I know zilch about repairing electronics. However, I also know that restoring these radios is important, for we will probably never see newer versions of them ever again. Long gone are the days of polished wood with carefully placed stylistic elements. Never again will radios be crafted to look like the furniture of your house. I have a few resources in mind for getting this baby up and going again, but even if I can’t, it will have a nice little home in my retro house. While digging through the piles in the shop, I came across this little gem that stood out because of the bold advertising. It’s a little hard to read, but the plate says, “Pies by Fasano.” I had no idea who Fasano was, but I liked how the pie plate had holes in the bottom and could be easily hung as a display piece in my kitchen, where it currently is. Curiosity got the better of me, however, and I did a quick search to find out who Fasano was and why his pies were so wonderful. 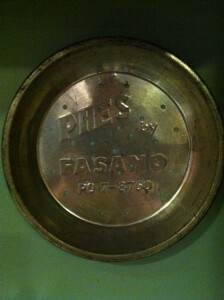 Fasano & Sons Bakery was a Chicago-based business that began in 1946. Its pies were quite the popular item, as evidenced from this news story which claims that 500-600 pies were delivered as part of a daily route back in the company’s heyday. The company shut down just over 25 years ago, but the grandson of the original owner has now started Fasano Pie Company back up again and seems to be doing some mad business in Chicago. Judging from its Facebook page, the company does a lot of fundraiser business, but their pies are also being sold by local restaurants. Facebook comments on their page rave about these pies, and yes, I did wonder how I could get my hands on one. Anyone up for a weekend trip?